Early Palestinian nationalism was influenced heavily by Nazism. While other nations have disavowed fascism (Germany and Italy, for example) and have since developed into thriving democracies, the Palestinians have not. Half of the world's major terror groups are Palestinian or have a Palestinian agenda. For the first time in the history, Hamas - the Palestinian branch of the Muslim Brotherhood and the ideological cousin of al-Qaeda - has gained full control over contiguous territory and population, and has now effectively become a state government without real opponents. Every Palestinian "political party" of note - Hamas, Fatah and PFLP - operates an armed militia listed as terrorist by the US and EU. Hamas and Fatah execute Palestinian captives, attack Palestinian hospitals, put journalists at serious risk. Hamas and Fatah formed jointly the Palestinian government of, by and for terrorists, now torn apart by unprecedented levels of violence between Palestinian factions. Since the 2006/7 Hamas-Fatah civil war, two rival Palestinian "governments" deny their legitimacy reciprocally and "rule" two politically and geographically separated non-states in the Gaza Strip (Hamas) and West Bank (Fatah). The Palestinian president refers to Hamas as "terrorist murderers", albeit only after Hamas tried to assassinate him, and outlawed the Hamas militia. More Palestinians were killed by their brethren than by anyone else. Both Fatah and Hamas do not recognize Israel's right to exist. Farouq Al-Qaddoumi, head of the PLO political bureau and secretary general of Fatah's Central Committee: "We [Fatah] were never different from Hamas. On the contrary; [Hamas] is a national movement and is part of the national movement. Strategically, we are no different from it." The Palestinian movement is still largely based on Israel's destruction. The greatest outpouring of attacks on Israel happened after Israel made the Oslo agreement, withdrew from southern Lebanon, the whole Gaza Strip, and virtually all populated portions of the West Bank, proposed an independent Palestinian state, and so on. In 2000, the Palestinians rejected a peace agreement that would have quickly ended the Israeli presence, created a Palestinian state, made possible repatriation of refugees, and provided more than $23 billion in international payments. Instead, they launched a disastrous war based mainly on terrorism. The Palestinians also failed to use the opportunity of the 2005 complete Israeli withdrawal from the Gaza Strip to build a stable polity. Instead, the collapse of Gaza in anarchy, radicalism, and violence provides a vision of what a Palestinian state would look like. 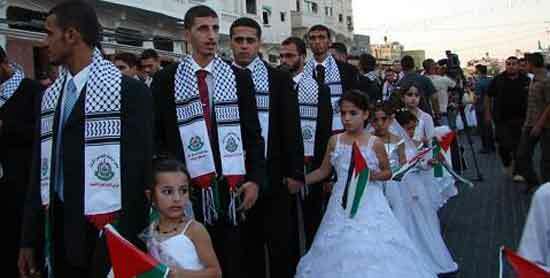 Palestinian society is quickly becoming a one-religion, one-identity and one-ideological entity of self-hatred. 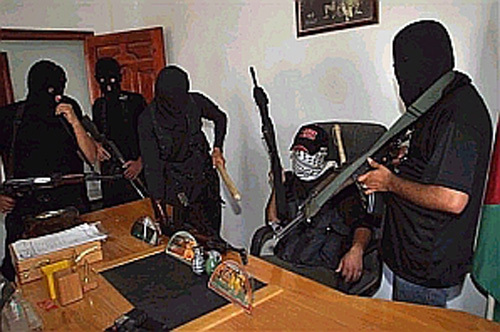 Hamas Charter, Article 27 (Palestine Center, Jun 6, 2007): "The Palestine Liberation Organization is among the closest to the Hamas, for it constitutes a father, a brother, a relative, a friend." 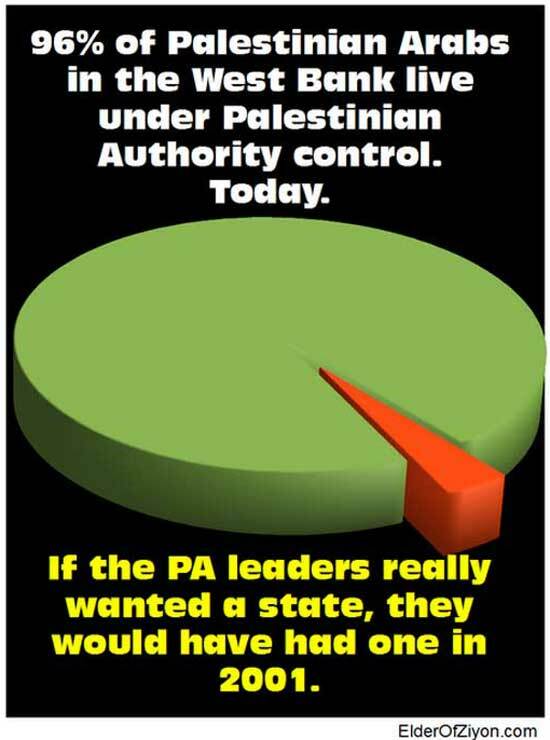 The mere existence of the Palestinian Authority is the result of Israel being the only power in history to have granted autonomy to the Palestinians. "Palestine" is the name of a geographical area. Never in history existed a state named Palestine. When the Arabs ruled the area - as a result of their imperial conquests from the 7th through the 9th century C.E. - it was out of their two Caliphal capitals, Damascus and Baghdad. Neither Arab Jordan or Egypt consented to Palestinian autonomy when the disputed territories - West Bank and the Gaza Strip - were under their occupation (from 1948-1967). Today Arab League asserts right to 22nd Arab state, 2nd one in historic Palestine. In 1995 and 1997, Israel relinquished control over virtually all of the West Bank’s and Gaza Strip's Palestinian residents. Since that time, nearly 60 percent of them –in main cities– have lived entirely under the Palestinian Autority's jurisdiction. Another 40 percent live where the Palestinian Authority exercises civil authority but, in line with the Oslo accords, Israel has maintained "overriding responsibility for security". In 2005 the Gaza Strip became the first independent Palestinian territory ever. Small scale conflict: under two Palestinians killed per day since Sep 30, 2000. The claims regarding the number of Palestinian casualties and their causes are not subject to independent verification, and there are documented examples where fictitious funerals have been held. In any case, many times more Palestinians were killed by Palestinians and while warring with Arab regimes like Jordan and Lebanon than in their war against Israel. Half of the world's major terror groups are Palestinian or have a Palestinian agenda - Palestinian Legislative Council rejects US anti-terror pledge - Arafat - godfather of international terrorism and Bin Laden's inspiration - The deliberate killings of Arab, Israeli, European, American civilians by Palestinian armed groups are both widespread and systematic, and are perpetrated as part of a publicly announced policy to target civilians. The PA collects no taxes from its own people, a luxury never mentioned by those bemoaning the PA's poverty - Most money provided by donor countries went to funding violence, lining corrupt officials' pockets, and paying salaries as a way of buying support - Palestinians received the largest amount of money per capita in the history of foreign aid but this was still not enough to balance the budget - Cutting aid could be really effective is in blocking Hamas from hiring thousands of its militants as internationally subsidized terrorists, teachers, officially appointed clerics or media workers paid by Western taxpayers to commit violence and spread hate - Palestinian despot Arafat in Forbes Report "The World's Richest People"
The Fight for Arafat’s Fortune Begins (Aljazeera, Nov 1, 2004): "Sources close to the Palestinian leadership said a bitter fight had broken out over who should control the ailing leader’s fortune estimated to be between $4.2 billion and $6.5 billion." End sleaze or lose aid, Arafat told (Ross Dunn, The Scotsman, Feb 29, 2004): "The World Bank has issued the Palestinian Authority with an ultimatum to put an end to rampant corruption or lose hundreds of millions of pounds of vital foreign aid. The Bank’s top official in the region, Nigel Roberts, said Yasser Arafat had to stop the handing of large cash payments to his security commanders - used to keep them loyal to Arafat personally - and other financial practices open to corruption. Otherwise, he said, the Palestinian Authority risked losing the support of the international community. In an interview with Scotland on Sunday, Roberts said the Palestinians were receiving the largest amount of money per capita in the history of foreign aid but this was still not enough to balance the budget." Understanding Palestinian Politics (Prof. Barry Rubin. Foreign Policy Research Institute, Nov 5, 2004): "Who will be the key players and factions in post-Arafat Palestinian politics? There are unfortunately far too many of them. Arafat's legacy will be fought over by at least five major factions, three separate institutions, and fourteen different security agencies in his own group Fatah alone. That leaves aside the Islamist organizations and smaller PLO groups, and individual rivalries or ambitions within all these groups. 'Factions' is probably too precise a word. No real parties exist: there are no disciplined groupings or generally recognized charismatic leaders. The structure is loose and rapidly shifting. Ideology is virtually non-existent; there is no meaningful Left, Right and Center. In general, too, connections between local leaderships in the West Bank and the Gaza Strip are weak, and there is no clear hierarchy or chain of command." 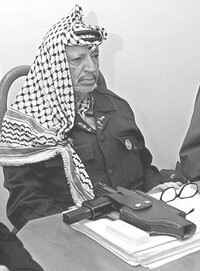 Destructive Legacy (JP, Nov 7, 2004): "Arafat leaves another legacy: the first society in history to have glorified suicide-murders on a national scale, starting from grade-school children." 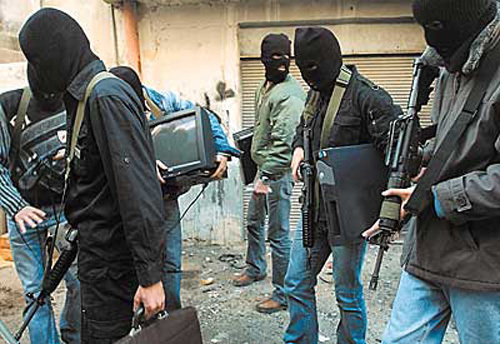 A Gangster With Politics | After Arafat, what's left of the Palestinian cause? Not much. (Bret Stephens, Wall Street Journal, Nov 7, 2004): "... he was also one of the 20th century's great political illusionists." President Discusses Roadmap for Peace in the Middle East. Remarks by the U.S. President on the Middle East (Mar 14, 2003): "The Palestinian state must be a reformed and peaceful and democratic state that abandons forever the use of terror. ... And the Arab states must oppose terrorism, support the emergence of a peaceful and democratic Palestine, and state clearly that they will live in peace with Israel." Where Hatred Trumps Bread. What does the Palestinian nation offer the world? (Cynthia Ozick, Wall Street Journal, Jun 30, 2003): "... the most ingeniously barbarous Palestinian societal invention, surpassing any other in imaginative novelty, is the recruiting of children to blow themselves up with the aim of destroying as many Jews as possible in the most crowded sites accessible. ... The child who has been taught to die and to kill from kindergarten on, via song and slogan in praise of bloodletting, represents an inconceivable cultural ideal." 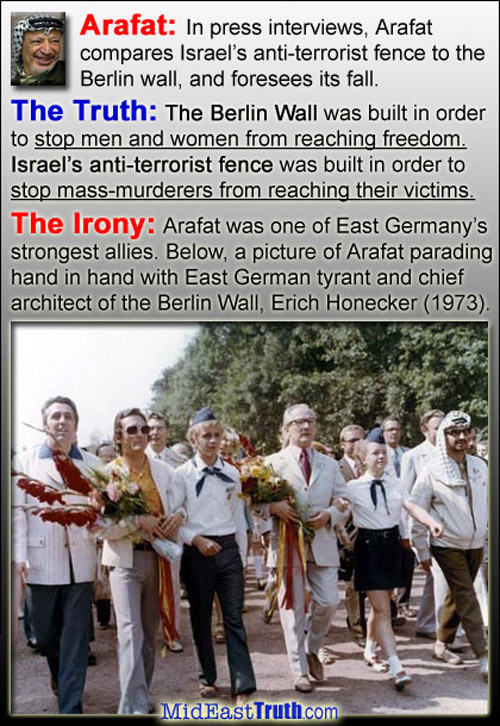 Hamas Uber-Alles (David Meir-Levi, FP, Feb 24, 2006): "... Hamas’ goal is not just the conquest of 'Palestine'. This is now the only democratically elected political power in the world whose foundational agenda includes the genocide, and whose sole defining paradigm is terrorism." Palestinian Legislator Pleads Guilty to Assisting Terrorism (Greg Myre, New York Times, Sep 5, 2005): "A prominent member of the Palestinian parliament, Husam Khader, pleaded guilty on Sunday in an Israeli military court to charges of assisting an armed Palestinian faction that has carried out many attacks against Israel, the military said." Bin Laden's inspiration (Alan Dershowitz, professor at Harvard Law School, JP, Nov, 12, 2004): "Yasser Arafat was the godfather of international terrorism who dashed his people's hope for statehood, stole billions of dollars intended for the relief of their suffering, and indoctrinated their children with so much hatred that they willingly turned themselves into human bombs." The mere existence of Arafat's Palestinian Authority is the result of Israel being the only power in history to have granted autonomy to the Palestinians. Neither Arab Jordan or Egypt consented to Palestinian autonomy when the disputed territories - West Bank and the Gaza Strip - were under THEIR occupation (from 1948-1967). The Palestinians rejected, among others, the Peel Commission partition proposal of 1937 that would have given them a state three times Israel's size, the UN partition plan that would have given them a state in 1948, and in 2001 Israel's offer of 97% of Gaza and the West Bank and a land swap within the Green Line for the rest. The All-Palestine Government (APG) was established in Gaza in September 1948. On October 1, 1948, an independent Palestinian state was declared in Gaza by the Palestinian National Council (PNC) - although only half of the municipal and village leaders had arrived out of the 150 invited. Haj Amin Al Husseini, a fugitive collaborator of Nazi Germany leader Adolf Hitler, was elected President of the PNC as well as President of the Higher Council - a sort of presidential institution to stand above both the APG and PNC, the executive arm and the legislative arm, respectively. The APG was recognized only by Egypt, Syria, Lebanon, Iraq, Saudi Arabia, and Yemen, but not by Transjordan and other Arab states or any non-Arab country. On October 1, 1948, the very same day the PNC's deliberations began in Gaza, the First Palestinian Congress of Palestinian mayors, tribal leaders and notables adopted in Amman a number of resolutions; the establishment of the APG in Gaza was ruled contrary to the wishes and interests of the Palestinians; Transjordan and Palestine were termed a single territorial entity that must remain a single political entity. The Gaza Strip was the only area of the former British Mandate for Palestine under the factual and official sovereignty of the All-Palestine Government. In effect, the Gaza Strip was under direct Egyptian administration, though Egypt never laid any claim to or annexed the territory. 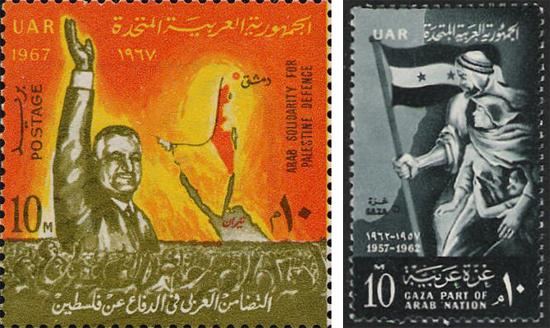 After the 1958 unification of Egypt and Syria in the United Arab Republic (UAR), the UAR President Gamal Abdel Nasser officially annulled the All-Palestine government by decree in 1959; no significant Palestinian opposition is on record. The Arab-Israeli conflict is not really a dispute over land or religion. Rather, it is a conflict between good and evil, between democracy and tyranny, between those who sanctify life and those who glorify death. It is a conflict between those who believe in due process and those who believe in summary execution. 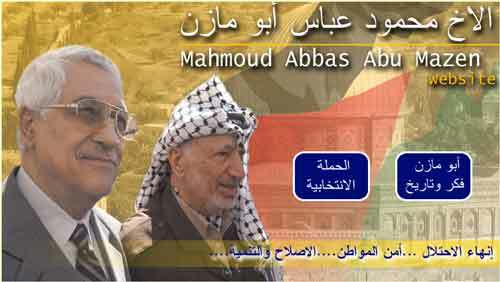 In choosing the depravity of dismembering civilians, Arafat's Palestinian Authority murderers have cast off the image of God. While Israel has always been prepared to negotiate a settlement with the Palestinians, their leaders have instead made a pact with the devil. Sending murderers to blow up teenagers is not an abrogation of a treaty signed in Norway. It is the apogee of wickedness. Teaching schoolchildren that one goes to heaven for killing Jews is not irresponsible. It is evil. Blowing up teenagers outside a disco is not merely morally repugnant. It is satanic. And Palestinian leaders who justify these bestial means are not desperate, they are satanic. Whatever grievances the Palestinians claim to have against Israel, choosing to settle them by maiming and murdering innocent men, women, and children is a crime against God and a sin against humanity. The Jews would have every right to claim to be the most desperate people of the world. 6 million Jews, 1/3 of the Jewish people, were turned into piles of ashes by the Nazi murderers. But the Jews never retaliated by machine-gunning German schoolgirls. More than a million Armenians were slaughtered by the Ottomans in World War I. But they never responded by blowing up coffeehouses. China completely overran and occupied Tibet. But the Dalai Lama never called upon his monks to bomb kindergartens. Only the Palestinians have chosen this course and in so doing they have gone over to the dark side. Of the original 1922 League of Nations Palestine Mandate to establish the Jewish National Home (120,000 sq km), Israel got only 17% (20,330 sq km), while Arab Jordan got 77% (91,971 sq km). Golan Heights (1,200 sq km): 1%. The West Bank and the Gaza Strip are the remaining 5% of the former British Mandate and are today under Israeli or Arab Palestinian home rule, their current status subject to the Israeli-Palestinian Interim Agreement, their permanent status to be determined through further negotiation. The disputed West Bank and Gaza Strip area of 6,220 sq km is matching equivalent to a circle with a radius of 45 km. This is 1/2400 (0.04%!) of the total area of the Arab world & Iran (15.15 million sq km). In Need of A New Abbas (Charles Krauthammer, Washington Post, September 12, 2003): "Abba Eban once famously said that the 'Palestinians never miss an opportunity to miss an opportunity.' ... For 56 years, every time the Palestinians were offered the possibility of a state side by side with Israel, they chose rejection and violence." Palestine for the Syrians? 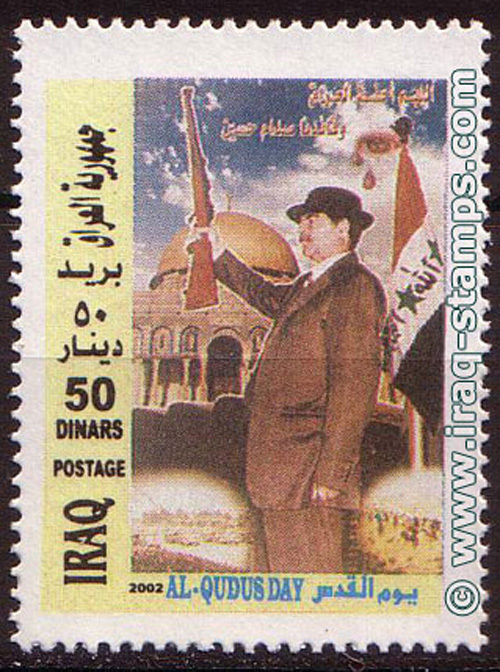 (Daniel Pipes, Commentary, Dec 1986): During a meeting with leaders of the Palestine Liberation Organization (PLO) in 1976, Syrian President Hafiz al-Asad referred to Palestine as a region of Syria, as Southern Syria. He then went on to tell the Palestinians: "You do not represent Palestine as much as we do. Do not forget one thing: there is no Palestinian people, no Palestinian entity, there is only Syria! You are an integral part of the Syrian people and Palestine is an integral part of Syria. Therefore it is we, the Syrian authorities, who are the real representatives of the Palestinian people." Muslim versus Muslim; Jews kill a Palestinian and its death to Israel (Faith Freedom International): "Since 1970 more than 4 million Muslims have been killed by Muslims in the Iran-Iraq war; Somalia; Afghanistan; Kurdish persecution in Iran, Turkey, and Iraq; 20,000 Muslims killed in Syria in 1982; Pakistan-Bangladesh war; 100,000 Shia Muslims killed in Iraq, Afghanistan, and Pakistan in the last 12 years; Algeria; Tajikistan; and other inter Islamic conflicts. While the plight of Christians and Animists in Sudan remains hidden from most people despite 2 million mainly Africans being killed by the Arab Islamic regime, including forced starvation and slavery. Yet Arabs and Muslims state time and again that they are brothers and that Palestinian Arab suffering is a crime against humanity. While Arab persecution of all non-Muslims in Saudi Arabia; slavery in Sudan and massacres of non-Muslims; Berber persecution in Algeria; Coptic Christian persecution in Egypt; and other hostile acts by Arabs remain hidden from the mass media." (From World Bank's Press Release No: 2003/241/MNA): "Twenty-seven months after the outbreak of the intifada, 60 percent of the population of the West Bank and Gaza live under a poverty line of US$2 per day. The numbers of the poor have tripled from 637,000 in September 2000 to nearly 2 million today. The World Bank’s new report, “Two Years of Intifada, Closures and Palestinian Economic Crisis”, surveys the economic and social damage caused by the current conflict and proposes measures to help stabilize the ailing Palestinian economy ... All Palestinian economic indicators continued their dramatic decline through the second year of the intifada. Gross national income per capita has fallen to nearly half of what it was two years ago. More than 50 percent of the work force is unemployed. Physical damage resulting from the conflict amounted to US$728 million by the end of August 2002. Between June 2000 and June 2002, Palestinian exports declined by almost a half, and imports by a third. Investment shrunk from an estimated US$1.5 billion in 1999 to a mere US$140 million last year. Overall national income losses in just over two years have reached US$5.4 billion ? the equivalent of one full year of national income prior to the intifada.The Palestinian Authority’s (PA) financial situation remains precarious. As a result of rising unemployment, reduced demand and the Government of Israel’s withholding of taxes collected on the PA’s behalf, monthly revenues dropped from US$91 million in late 2000 to US$19 million today. A collapse of the PA has been avoided by donor budget support, which totals US$1.1 billion over the last two years. Seventy-five percent of this has come from Arab countries. The recent resumption of revenue transfer by the Government of Israel is a positive development. With unemployment rising and incomes collapsing, over half a million Palestinians in this formerly middle-income economy are now fully dependent on food aid. Per capita food consumption has declined by 30 percent in the past two years, and the incidence of severe malnutrition recently reported in Gaza by Johns Hopkins University is equivalent to levels found in some of the poorer sub-Saharan countries. The proximate cause of Palestinian economic crisis is closure - the imposition by the Government of Israel (GOI) of restrictions on the movement of Palestinian people and goods across borders and within the West Bank and Gaza. Closure is viewed by GOI as regrettable but necessary in order to protect Israeli citizens from violent attacks." Who Is Really Oppressing the Palestinians? (David Meir-Levi, FP, Feb 3, 2006): "A heartless, Machiavellian Arab leadership bent on violence, war, terrorism, destruction and genocide subordinated Palestinian hopes and aspirations to their own dark plans; even while Zionists in the pre-State period and the Israeli government thereafter accepted, supported, and attempted to assist the Palestinian people." The truth about Christians in 'Palestine' (Arab-American journalist Joseph Farah. 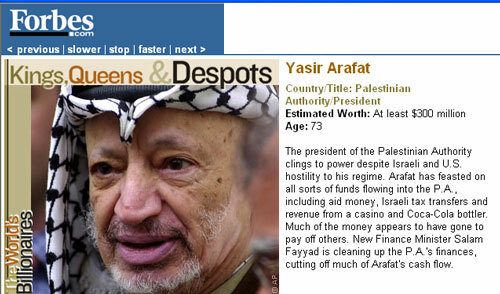 WND, Feb 28, 2003: "Arafat's Islamo-fascist storm troopers have shown nothing but contempt for Christians and their holy sites – particularly in the last five or six years." Jerusalem Arab tortured and murdered over home sale to Jews (Khaled Abu Toameh, JP, Apr 14, 2006): "In 1995, the Palestinian Legislative council voted unanimously in favor of the death sentence for land brokers who sell lands to Jews. Former PA justice minister Freih Abu Medein announced that the death sentence would be applied to land sellers based on the Jordanian law which was authorized as PA law. The PA mufti of Jerusalem, Sheikh Ikremah Sabri, announced a fatwa in the same year authorizing the killing of any Arab who sells property to Jews. The fatwa also forbids Muslims from burying the perpetrators in Muslim cemeteries." 1941, Nazi Germany leader Adolf Hitler and Palestinian Arabs and World Muslim Congress leader Haj Amin El Husseini | Meeting minutes | Nov 2, 1943, Nazi Germany solidarity telegram: "To the Grand Mufti Amin El Husseini: The National Socialist movement of Greater Germany has, since its inception, inscribed upon its flag the fight against the world Jewry. It has therefore followed with particular sympathy the struggle of freedom-loving Arabs, especially in Palestine, against Jewish interlopers. In the recognition of this enemy and of the common struggle against it lies the firm foundation of the natural alliance that exists between the National Socialist Greater Germany and the freedom-loving Muslims of the whole world. In this spirit I am sending you on the anniversary of the infamous Balfour declaration my hearty greetings and wishes for the successful pursuit of your struggle until the final victory. Signed: Reichsfuehrer SS Heinrich Himmler"